We have been Dundas residents as well as annual members and supporters of the Hamilton Conservation Authority for years. We strongly believe that the unique features of the Dundas Valley area need to be realized and preserved for future generations to enjoy and for the sake of the ever shrinking natural environment. For the last three years, we have been conducting a study on the pattern of movement of deer through the city, between the bottom of Longwood Road in Hamilton and the west end of the Dundas Valley area. We usually do this at night, when the deer are out for feeding and on the move. We do this in order to gain a solid understanding of local conditions necessary for deer survival. The main goal and reason for our study is to collect information that may be helpful in preventing development of infrastructure and projects interfering with the ability of the deer to feed, hide, and move around following the seasons and the food available to them. One of the places that we frequently observe is the Sanctuary Park at the end of Sanctuary Drive in Dundas. It contains a washroom/maintenance facility, a playground, and two soccer fields. This is an area where deer have been feeding at night, especially in late fall, in winter, and in early spring. Last year and two years ago, at this time of the year, there were anywhere between 6 and 18 deer regularly feeding there at night. The name “Sanctuary Park” suggests that it must have been the case for a long time; that the area was once recognized as an important ecological sanctuary and was protected from alterations to preserve its natural state. This year, for the first time, there is an Outdoor Skating Rink created and maintained in the park’s eastern soccer field. Also, a very strong light has been fixed on the eastern wall of the washroom/maintenance facility located in the middle of the park. This light stays on all night, even though the park officially closes at 11 p.m. It covers most of the eastern soccer field and the open areas east and south of it. Just recently, two strong area lights have been added above the NE corner of the facility. These lights face north and cover the main part of the ice rink which overlaps the central and north part of the lower (eastern) soccer field. They are on a timer and are being turned off at 11:00 p.m.
As indicated in Picture 1, below, the lower soccer field, together with the open area to the east, have been a major deer feeding ground for years. Due to a longer growing season than in the wooded and shaded areas of the surrounding valleys, deer regularly feed in the Sanctuary Park in late fall, in winter, and in early spring. The park itself is not an isolated urban infrastructure; it is an integral part of a larger ecosystem and therefore it is unique and different than most inner-city parks. It has been an important and inseparable part of the Dundas Valley area on which deer and other wildlife depend on for their survival. During the last few weeks, we have noticed that deer do not come to feed in the Sanctuary Park anymore, not even in their favourite feeding spot at the northern end of the lower soccer field. This clearly is due to the new ice rink, the snow banks surrounding it, and the new artificial lighting. The ice is also damaging the turf and the grass underneath, which will not be available in March and April, when deer intensely feed in this area. At this time of the year, a part of the deer menu is grass that they dig out from under the snow. It is not possible for the deer to dig out the grass from under the ice and the snow banks surrounding the ice rink. some of the animals feeding on worms, rodents, and rabbits loose their source of food – (for example foxes, coyotes, racoons). Although only a part of the Sanctuary Park is covered by the ice rink, it happens to be the part in which deer were feeding in winter and spring, in previous years. The alteration of natural habitat in the Sanctuary Park is also caused by the strong artificial lights which spook and keep away the deer and other animals. Due to a high human and dog traffic during the day, deer have only been feeding in this park at night, and this is exactly when the lights are on. As you can see, the outdoor ice rink in the Sanctuary Park causes a chain reaction that is affecting not only the deer, but also the food chain involving other wildlife in the area. On a few occasions during the last two weeks, we have seen isolated tracks of deer approaching the park from the north, and then going back into the valley. The usual deer entrance points in winter are from behind the soccer nets on the far (north) side of the park and from behind the southern net in the lower soccer field. Since the introduction of the ice rink and the new lighting, there are no deer in sight in the park or in the surrounding valleys, which is quite unusual for this time of the year. The ice rink has no permanent intrusion on the area except for the lighting. Since the park is already being used as a soccer location, the ice rink would be considered no more invasive. I would appreciate your data on the deer movement to see if they adjust to the change, and I wonder if they would feed more in Warren Park due to the altered site at Sanctuary. Requesting the ice rink was not intended to do anything but bring a sense of community to the park. 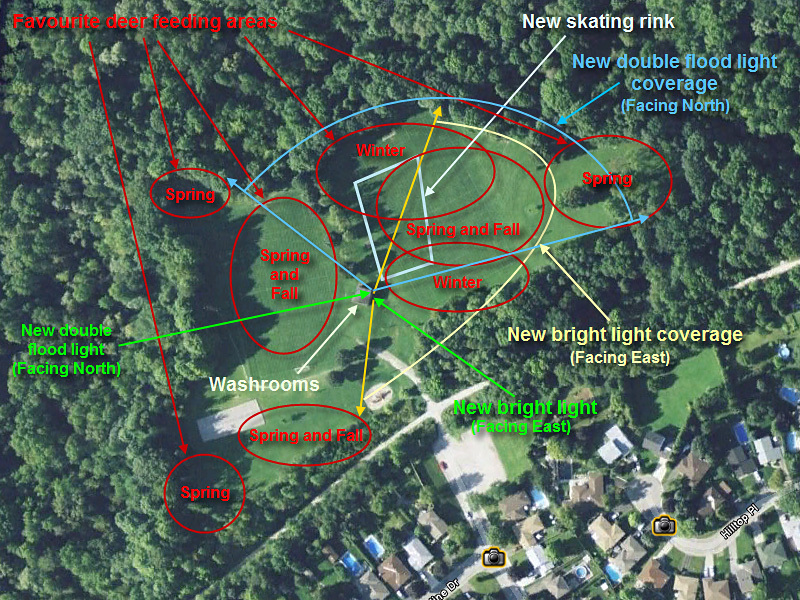 We agree that the ice rink at Sanctuary Park is not an intrusion on the area but, as shown above, it is a significant invasion and alteration of the natural habitat and the Dundas Valley ecosystem. It is also much more invasive than a soccer field. Soccer fields do not destroy grass – quite opposite. They don’t restrict access to the grass. Ice rinks cover the grass, press it down, and limit access to it. Soccer fields do not alter the chemical and biological composition of the soil. Prolonged ice cover does. No artificial lights are needed for soccer fields, which are mostly used in summer and during the day light hours. Right now, the strong light on the eastern wall of the washroom facility, together with the two powerful area lights installed above the roof, cover the entire lower soccer field and the open areas N, E and S, and SW of it, as well as the northern part of the area between the soccer fields and a triangular part of the upper soccer field going as far as the net on the far end of the field. This happens to be the area were deer were most frequently feeding in late fall, in winter, and in early spring. Due to the pressure created by the ice and increased pedestrian traffic around it, both the grass and the snow have been pressed down. The grass has been pressed into the ground and the snow has hardened, making it impossible for deer to feed. It is easy to see that, from an environmental point of view, this particular ice rink is much more intrusive and invasive than a soccer field. And there is a proof – deer have been feeding in Sanctuary Park and on its soccer fields for years, but stopped coming to the area this winter, after the lighting and the ice rink had been introduced. That is a clear evidence of the degree of intrusion, invasion, and ecological alteration. With the high number of deer in the area as well as limited and shrinking resources available to them, it is difficult to talk about “adjusting to change”, as this would imply that moving the deer around Dundas Valley could somehow solve the problem. It does not seem possible. There is a lot of pressure on all existing deer feeding areas and all suitable places already have their local “visitors”. Some environmental changes are currently taking place that force the deer to abandon the eastern limits of their habitat (east of University Plaza) and shift to the western part of the Dundas Valley area. (Please see the attached Annex 1 for details). The resources are shrinking – for example many of the apple trees in the former orchard on the Main Loop Trial, which is one of the main deer winter feeding spots in Dundas Valley, have died and collapsed. As a result, the apple buds that deer used to feed on are no longer available. Therefore, closing or limiting another major deer feeding ground in the area, such as the Sanctuary Park, will very likely result in deer starvation. Unfortunately, there is no alternative available, unless the deer are relocated to a completely different area or depopulated by other means. According to our observations, the deer have not adjusted to the change by feeding more in Warren Park due to the altered site at Sanctuary. (Please see the Attached Annex 2 for details.) Instead, they are moving westward and entering the already saturated feeding grounds in central and western parts of the Dundas Valley area. This is a recipe for an ecological disaster. We have been informed of the general policy and the protocol for the application and approval process for an outdoor ice rink in the City of Hamilton. We were surprised to see that it did not include a scientifically competent environmental assessment of the impact the ice rink project would have on the ecosystem and the deer population, especially in such a complex and fragile area as the Dundas Valley. With respect to the local volunteers who initiated and who maintain the ice rink project in the Sanctuary Park, we understand their reasons and their motivation. However, we believe that they fail to see the bigger picture and fail to take it under consideration. Therefore, we cannot support their position. Animals cannot advocate for themselves and this is why we do it on their behalf. The Dundas Valley Conservation Area has been developed, and protected for generations. Many local politicians, activists, and organizations took part in this collective effort. We cannot allow this great and unique characteristic of our city to be destroyed for the benefit of a small and somewhat selfish group of local citizens. To reverse all alterations recently done to the area, including the ice rink, the surrounding snow banks, and the artificial lighting. Generally, deer move more frequently in search of food in late fall, winter, and early spring, than in summer. In summer there is enough food for them in the wooded areas and they don’t have to “come out of the woods” to feed. This winter, deer are observed less frequently and in smaller numbers in the eastern part of their main movement route through the city. 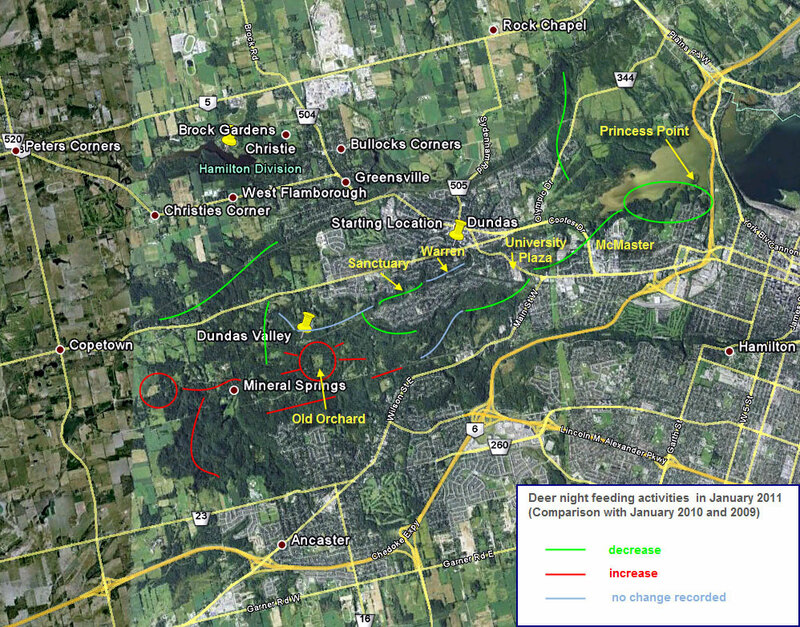 There is an increased movement and pressure on feeding areas in the western part of Dundas Valley, especially around the old orchard located on the Main Loop trail, along the Mineral Springs Road, around and west of Mineral Springs, and at the edges of the wooded area west of Binkley Road. Something is beginning to push the deer westward. Whether this trend is caused by permanent environmental changes or by a temporary fluctuation remains to be seen. Another current observation is that feeding and on-the-move deer tend to stick to a higher ground and avoid the bottom of the valleys, unless in large, open areas. This may be their response to increasing numbers of coyotes. Deer can outrun coyotes downhill but not uphill – and this is probably why they learn to stick to a high ground for protection, especially in winter, when there is less natural cover. Following our earlier observations, we recently spent two nights checking the Warren Park (from the Tally Ho entrance to the Sanctuary Park) and the Spring Creek Trial (from the Sanctuary Park to Dundas Valley Trial Centre). It was a perfect time to collect data, as both nights followed a fresh snowfall and we could easily distinguish new tracks left by animals during the specific night the observation was conducted. In the Warren Park – there were no deer in sight anywhere, only a few single and isolated deer tracks, mostly leading across the valley, none going along. The Warren Park trial is located on the bottom of a narrow valley with quite high and steep slopes on both sides. This may explain why the deer are passing across, rather than going along the park – they stay in the high ground. It seems that, at this time, deer don’t find suitable feeding spots in Warren Park, as we could not find any areas where deer in larger numbers would stay and graze for a longer time. We however saw fresh tracks of two small deer leading from the entrance of Warren Park across Tally Ho and along the front yards on Lantern Lane. At the Sanctuary Park, a few fresh deer tracks came from the north and up the slope to the back of both soccer fields, but did not enter the area and returned back to the valley. No evidence of deer approaching from the south, west, or east was found. In and around the park, no deer was directly spotted. This is quite unusual for this time of the year. On the Spring Creek Trial – starting from the Sanctuary Park and going west – we found a few tracks but no deer in sight, again. This is unlike previous years, when the numbers were higher and visible. The second half of the Spring Creek Trial, (the one closer to the Dundas Valley Trial Centre), showed a few more tracks and we saw four deer feeding along the pond (south of Moss Blvd) and in the open fields (south of Wainwright Blvd.). As usually, there were a few deer feeding in the fields surrounding the Dundas Valley Trial Centre (the old train station), on the slopes west and north of the parking lot, and along the Sawmill Trial – but the observed numbers were lower than in January a year ago and two years ago. There was much lower deer traffic than in previous years along the entire Pleasant Avenue subdivision with only a few deer beginning to enter Little John Rd. between Lynden Ave. and the back of University Plaza. These, however, come from the woods south of Pleasant Ave. subdivision, not north of it, where the Sanctuary Park is located. The number of deer feeding at night on the trail and in the valley behind the University Plaza is increasing. However, there are no tracks indicating yet that the deer started to use the crossing of Osler Drive, at its low point east of the University Plaza and accross from the Water Station. Deer in large numbers are beginning to feed along Pleasant Avenue, between Skyline Drive and Green Meadow Way. At 3:15 a.m., while driving by one single time, we saw 14 deer feeding in the front yards of private houses or walking in the middle of the streets. On Skyline Drive, a running deer crossed the street less than one meter in front of our car. There were still no deer in the Sanctuary Park, where they used to feed at this time of the year in previous years. As a result, more deer are forced to feed on the streets of the Pleasant Avenue subdivision. This creates a potentially dangerous situation, both for the drivers and for the deer. There will be more car accidents and more deer are going to be killed. This entry was posted in Sanctuary Park and tagged City of Hamilton, Dundas, Dundas Valley, Dundas Valley Conservation Authority. Bookmark the permalink.